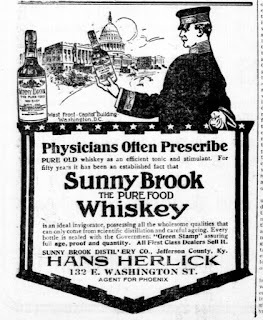 If you've ever wondered about what people say about the massive consumption of whiskey in the Old West, even in old-time Phoenix, yes it's true. But like so many things that we look at in the past, it can be very difficult to imagine it with our modern eyes. As a 21st Century man who enjoys a glass of whiskey now and then, I can understand the attraction. Of course, I only have small amounts, in moderation, and only in moments of relaxation. I've never been a big drinking man, and after a shot or two I'm mostly glued to my chair, and then I need to go lie down. I can't imagine doing anything constructive with whiskey inside of me, like building a city, or fighting in the Civil War, but a lot of people did. Time-travel with me to territorial Phoenix. It's a harsh place. Air conditioning wouldn't be invented for a very long time, and while there are doctors and dentists, they're nothing like what we have now. People lived with the kind of pain that nowadays we can hardly imagine. And yes, they "self-medicated" - with whiskey. Now don't get me wrong, people in Phoenix weren't stumbling around drunk all of the time. In fact, drunkenness was considered to be a very bad thing. A man's ability to "hold his whiskey" was part of his badge of honor. Only fools got drunk. Men could "take a snort" from their flask, and get out and do the work to be done. Obviously times have changed. I would be very surprised to see the local Sheriff with a flask in his pocket nowadays, as much as I would be surprised to see the local Sheriff in Territorial Arizona without one. 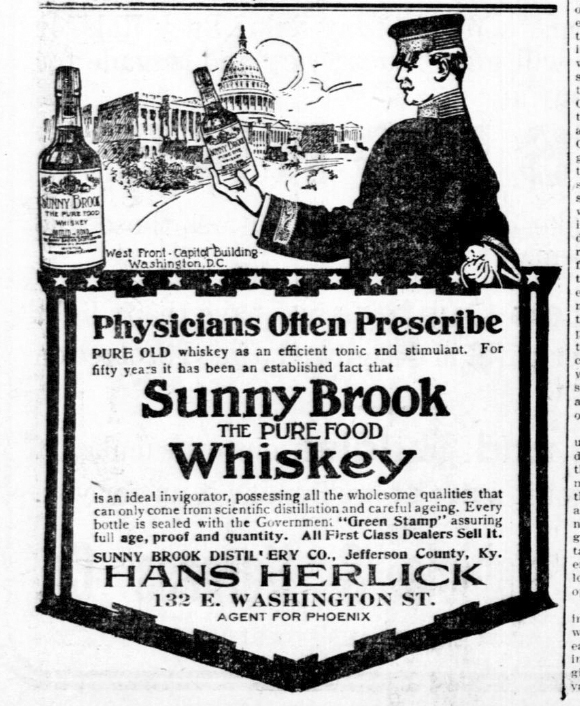 Yes, people drank whiskey in old-time Phoenix. A lot of it. They also built a city at the same time.